A small leak can often go undetected allowing oil to penetrate the ground surface under the tank contaminating the soil and groundwater. The positioning of a containment tray or dike around the tank can help to collect the leaking oil. A spill containment dike is recommended for indoor tanks to help prevent the oil from spreading throughout the basement and damaging the home or escaping through a floor drain. Whether the tank is located inside or outside the home it should be supported to prevent it from shifting, settling or falling over. Most tanks used for domestic heating oil are steel containers that hold about 1000 liters (200 gallons) and weigh about 1000 kilograms (1 ton) when full. Their tall, narrow shape lets them easily pass through standard doorways, but it also makes them fairly unstable. Domestic oil tanks are not designed to last forever and must be properly maintained and replaced after their effective service life. In some areas the tank and lines have to be replaced every 10-15 years. All tanks must be CSA or ULC approved. One of the reasons why tanks have a limited lifespan is the onslaught of rust. Consumed oil will be replaced by air. Moisture in the air will condensate and settle on the bottom of the tank where it can cause rust and leakage. If enough water accumulates it can get in the fuel line. Keeping the tank full will slow down the condensation process. Any presence of water within the tank should be pumped out by a qualified technician. 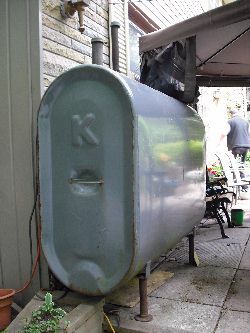 Oil tanks should be inspected annually. In P.E.I and Ontario for instance, heating oil cannot be delivered unless there is an inspection tag attached to the tank. Exterior installed oil tanks and oil lines should be protected from the elements during the winter season. Ensure that your outdoor tank is rated for outdoor use and properly supported. end of the heating season and checking it again at the beginning of the next heating season. Underground tanks that are of an unknown age, and not specially protected from corrosion are required to be removed. In some jurisdictions underground tanks are no longer permitted. Underground storage tanks together with connected piping and dispensers must be removed from the ground, if at all possible, once they are of no further use or have been out of service for two years. Oil lines should be protected from physical damage to prevent oil leaks.